I have created a nuffnang poll at the side of the page. Please click and let me know what you would like to read more on my blog. Currently 83% of you would like to read beauty related and girly stuff. And none of you on spiritual and inspirational post -_-. You incorrigible people want to go to eternal bottomless pit and play with bolts of fire issit? LOL (just kidding). Anyway, I do have lots of skincare products. I don't mind reviewing, just don't want to bore the wrong audience (so please poll if you haven't). 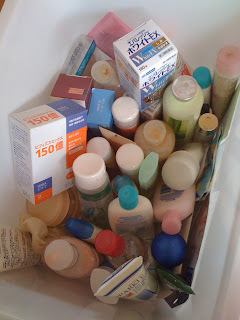 This is a box of skincare that I am not regularly using, some are still new and unopened. I have like two other boxes of these. I think I don't need to buy skincare for another year but I just can't stop buying.